In years gone by, when selling a park home, a significant amount of responsibility rested with the park owner and you would pay them a visit and complete any paperwork. However, all this changed in May 2013, The Mobile Homes Act was introduced to give more protection to park homeowners. Opinion is mixed on whether this has improved the selling of a park home. Some say the act was not needed, others disagree and say the act has helped confidence in the purchasing of homes by the public. 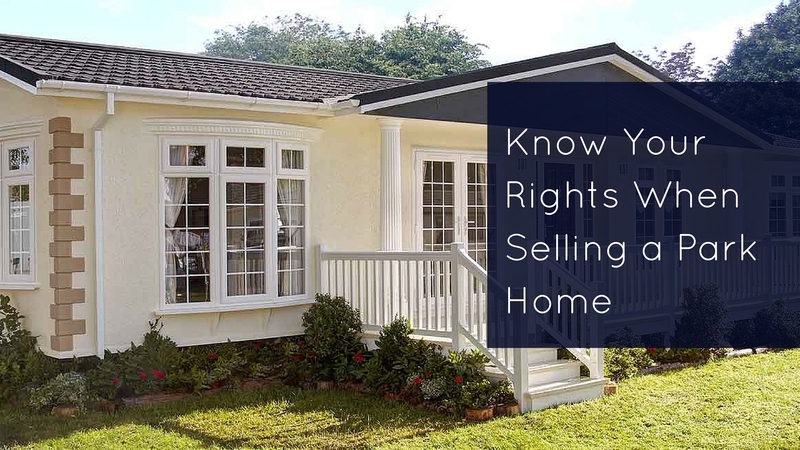 So it is still important that you know your rights and responsibilities when selling a park home and, as such, here we’ve outlined everything you need to know. The pitch fee is the payment that you make to your site owner as rent. While site owners are legally allowed to change these fees, they may only do so once a year and must provide you with 28 days’ notice in writing. They must also use a special form called a ‘Pitch Fee Review Form’, which explains the change and your rights. It’s important to know that any changes to pitch fees must be agreed by you first, and if you are unwilling to agree to a change, then your site owner must apply to a tribunal. Until the tribunal reaches a decision either way, you should continue to pay your current pitch fee. Before the Mobile Homes Act in 2013, park owners had much more involvement in who a park home could be sold to, allowing the park owner a degree of discretion on deciding on a purchaser. Fast forward to 2016, however, and you now have the right to sell your property on the open market, or could also give it to a family member if you so wished. The owner of your site doesn’t have any right to approve the buyer or new owner, although they will have to meet any rules that are in place at the park. Make you carry out a survey on the property. First things first you’ll need to find somebody to buy your park home, which is where we come in! Our dedicated team of park home experts can help you to find a buyer at the best possible price with minimum hassle. Once you have a buyer you’ll have to fill in a ‘Buyer’s Information Form’ which will give your buyer all the information they need about the site and the agreements in place with the site owner. A specialist adviser or solicitor will be able to help you with this if you have any issues. Both you and your buyer will have to complete a ‘Notice of Proposed Sale Form’. Here your buyer will have to agree to any site rules (for example some parks don’t allow pets or residents under a certain age). If the site owner believes that the new buyer doesn’t meet the site rules they will have to apply to a tribunal which they have 21 days to do so (and must inform you). If the park owner doesn’t apply for this tribunal in time then you can simply go ahead with the sale, but if they do, you may have to provide information to the tribunal, or they might grant a refusal order. If the site owner has no issue with your sale, or takes it to a tribunal and loses, then you can carry on with and complete your sale. You have one last form to fill out, which is an ‘Assignment Form’, which will transfer your pitch agreement over to your new buyer, who will then pay you 90% of the sale price (the site owner is entitled to the other 10% as commission).